Central Asia is a massive region of varied geography and climate. Kazakhstan, Kyrgyzstan, Tajikistan, Turkmenistan and Uzbekistan that make up this region feature mountains, vast deserts and treeless, grassy steppes. The region is classified as arid, which means water is an extremely valuable resource for around 70 million people who live there. 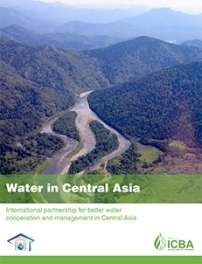 Water that mainly comes from the mountains in Kyrgyzstan and Tajikistan supplies more than 6,000 rivers, including the great transboundary rivers of Amudarya and Syrdarya, which downstream countries - Kazakhstan, Turkmenistan and Uzbekistan - depend on for their agricultural and other needs. The downstream countries also make up the Aral Sea basin which is home to millions of people who need water for drinking and farming. Water is, thus, critical to irrigated agriculture, which is the economic mainstay of the five countries. Kyrgyzstan and Tajikistan use water also to generate more than 90 percent of their electricity. As climate changes and water gets less, the competing demands of agriculture in the downstream countries and hydropower generation in the upstream countries raise serious concern over future regional collaboration.